Sometimes it's hard being a criminal mastermind. Click here to play! Sure, there's living on yachts, drinking the finest wine, eating at the trendiest restaurants and all that jazz... but it's so expensive! It seems like you need to rob a bank everyone month or two just to pay the caviar man. Well, it seems as if the thousands we took in our last heist wasn't enough. We need to Break Da Bank Again, and this time, nothing is going wrong. That last bank job was sloppy. Rubber Chicken Steve got his head taken off by a guard and Jimmy the James received a very stern talking to from a banker before we gagged the guy. If we're going to make the most of this criminal life, then we had best get our technique down pat to avoid further mishaps on this new job. Okay, so you want to know your part in this? Break Da Bank Again. That's all we need you to do. Get the right combination on the reels and 'click'. Open sesame, welcome to retirement... At least for another few months. I guess we could look into cost-cutting, but breaking into banks hasn't gone wrong for us so far, has it? Just Break Da Bank Again before the cops can show up and we'll take away thousands! Bank Vault symbols are scatter symbols. When 3, 4 or 5 symbols in onscreen, free spins are rewarded according to the number of scatter symbols: 15 free spins for 3 symbols, 20 for 4 symbols, and 25 for 5 symbols. Wins are paid at 5 times normal in free spins, and an extra free spin is awarded for every Bank Vault symbol that lands in the free spins. Additionally, 2 Bank Vault symbols pay twice the total bet. The Break Da Bank Again Logo symbol acts as a substitute for anything other than the scatter symbol. During normal play, all wins with a substitute symbol pay 5 times the usual amount. They pay 25 times the usual amount when a part of free spins. 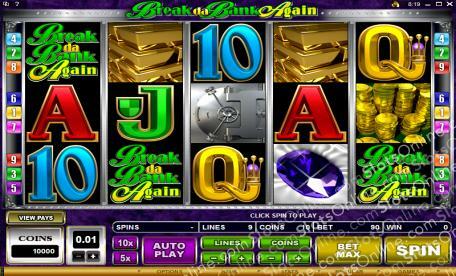 There is a gamble game available when a player wins on the slots game. In it, the player takes a guess about what a card will be. A correct guess of red or black pays even money on the stake, while guessing the suit correctly pays 4 times the stake. The stake is equal to the amount won on the triggering slots spin.